Is it worth hiring a babysitter for: Yes! Parking and Transportation: Parking is free with a bit of a walk to and from the restaurant. If it’s one-of-a-kind views you are seeking, one of the best outdoor dining options in Jersey City is Surf City. With panoramic views of New York City, how could you go wrong? Featuring seaside favorites such as Lobster Rolls, and rare creations such as Fried Clam Sandwiches. For those inclined more to the ‘turf’ than the ‘surf,’ there are a variety of burgers as well as Chicken Tenders and French Fries. With live music and a lively bar, this of your all-in-one parent’s night out! This place is not to miss the next time you are craving an outdoor dining experience in Jersey City. Is it worth hiring a babysitter for? Yes! Parking and Transportation: A short walk from the Essex Street Light Rail. Food-wise, this may be one of the best outdoor dining spots Jersey City has to offer: while it may not have spectacular views, the fact that Zagat described their food as “to die for,” makes it worth the trip. With delicately crafted, rare selections like “Seared Arctic Char, with Apricots, Piquillo Pepper Sauce, with Sundried Tomato Couscous,” who would not want to make the trek to this Paulus Hook gem. The ambience both inside and out, as charming as, but not as crowded as a West-Village Café, make this restaurant one of the best for outdoor dining in Jersey City. Although the exterior is a bit shabby, this restaurant offers some of the best for outdoor dining in Jersey City, a fact well known by the constant stream of people who frequent it. Rather than judging the restaurant by the way it looks, judge by the line you will see most evenings outside of its doors. Both the inside and the outside can be crowded, but take this as a sign of the quality of food; it’s worth bearing with the crowd. If you want tasty food for a good price, make this your next outdoor dining adventure in Jersey City. Parking and transportation: Parking is located within walking distance (a short walk), transit is not nearby. Known for its elegance and spectacular New York Harbor views, another of the best outdoor dining experiences in Jersey City is Maritime Parc. Sitting inside, you will be delighted by exotic faire, including Octopus with Crispy Potatoes, Pork Belly and Leek Puree, and delicious twists on classic dishes like Mash Potato rings (with grainy mustard Fondue). 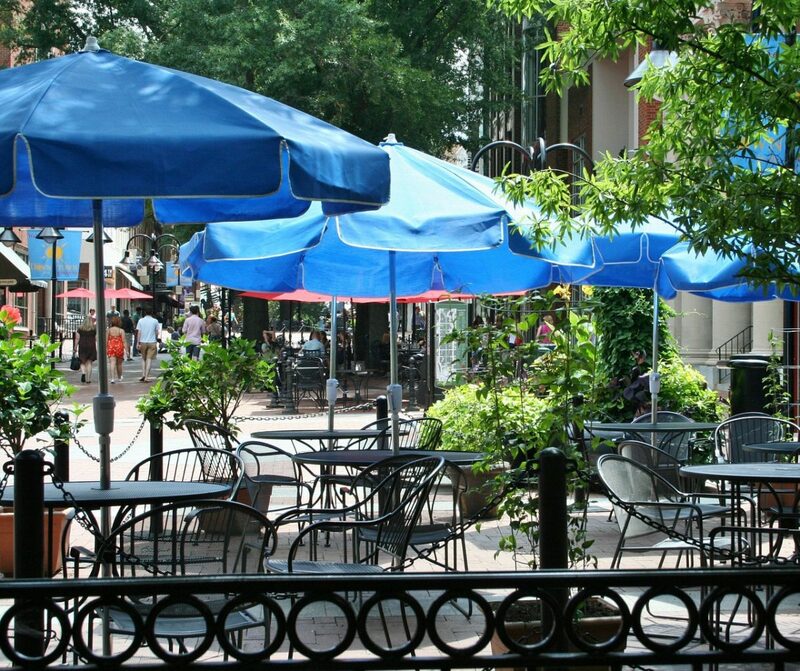 Sitting outside, you are bound to experience some of the best views Jersey city’s outdoor dining has to offer. What more could you ask for? The name of this restaurant Porta (“door” or “bring” in Italian) could not be more appropriate for what it is, and what it does. At Porta, you will be transported. Not only is this one of the best outdoor dining spots in Jersey City, but it has been hailed by GQ as one of the “best late-night spots in the country.” With ovens made in Italy specifically for the restaurant, the wood-fried Pizza is one of a kind in Jersey City and arguably in the country. If pizza is your passion and your craving a unique outdoor dining experience, this is your place. Oh, and not to mention there are two full bars! Parking and Transportation: Street Parking is not great, but not the worst in Jersey City. The restaurant is a few blocks from the Exchange Place Path station and a longer walk to the Newport Path. The food at Amiya coupled with its bustling outdoor patio are what rank it among the best outdoor dining in Jersey City. If the exquisite food is not enough for you, Amiya offers both outdoor and indoor ambience that rival that of any restaurant across the river; surrounded by downtown sights and sounds, you can watch the crowds passing by while sampling their unique blend of modern Indian and Chinese cuisine. With just a hint of contemporary style, this restaurant is a standout among Jersey City’s plentiful selection of Indian cuisine. Jersey City is full of life when it comes to their food just like Hoboken! Are you looking for places that are more specific to your dietary needs? No problem there are plenty of vegetarian/vegan and gluten free options!